Retro chic! 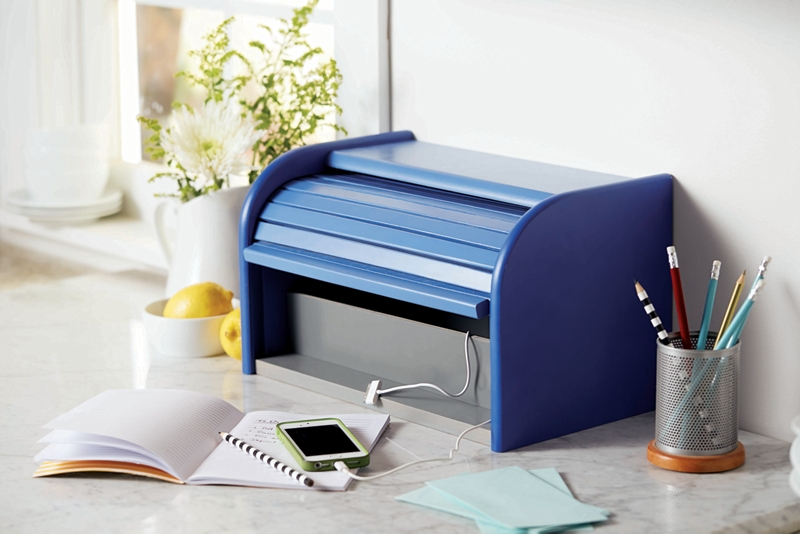 Update an 80s style breadbox into a fashionable charging station. Create a hole in the lower right or left corner of the back of the bread box with the 2 inch Forstner Bit. It helps to put painters tape on the inside of the box to prevent the wood from splitting. To create the shelf inside the breadbox, cut and measure a piece of plywood for the shelf and a smaller piece for the face. Attach the face to the shelf with nails. (This will slide into place and the back of the shelf will rest on the power strip). Drill 2-4 four holes in the back of the shelf for electrical cords. Sand the entire bread box inside and out. Vacuum — especially the nooks and crannies — and then wipe with a tack cloth. Paint the entire breadbox with Krylon® COLORmaxx™ Primer in Gray. Tape off the sides, back and bottom and paint the center portion Krylon® COLORmaxx™ Satin Periwinkle. Let dry. Tape off the center, back and bottom and paint the sides with Krylon® COLORmaxx™ Satin Iris. Let dry. Tape off the center and sides and paint the bottom of the breadbox with Krylon® COLORmaxx™ in Gloss Classic Gray. Let dry. Paint the shelf with Krylon® COLORmaxx™ in Gloss Smoke Gray. Let dry. Insert the Computer Grommet to finish off the hole in the back of the box. To assemble, place the power strip in the back of the box on its side so that the outlets face the front. Put the plug end of the power strip through the hole in the back of the box. Add chargers and turn the power strip on. Put charger cords through the holes in the shelf and then slide the shelf into the breadbox to cover the power strip. Add devices to charge as desired.